Phone booths were pretty well integrated into our society at one point, but they’re not very useful anymore—except perhaps in pop culture. Those who were born in the technology era may hardly be familiar with the tall, rectangular box made to fit one person and a telephone. You might still see a few of them in large cities, covered in graffiti and seemingly abandoned. You could make a call anywhere, for a certain price, and talk to the recipient in complete privacy—it was a modern miracle. But the cost of these phone booths became too much for cities, and they were replaced with simpler unenclosed pay phones. Then, cell phones became widely popular, and most pay phones and telephone booths are no longer in working order if they exist at all. There’s simply not a need for them. Unless you look at it from the perspective of an artist. 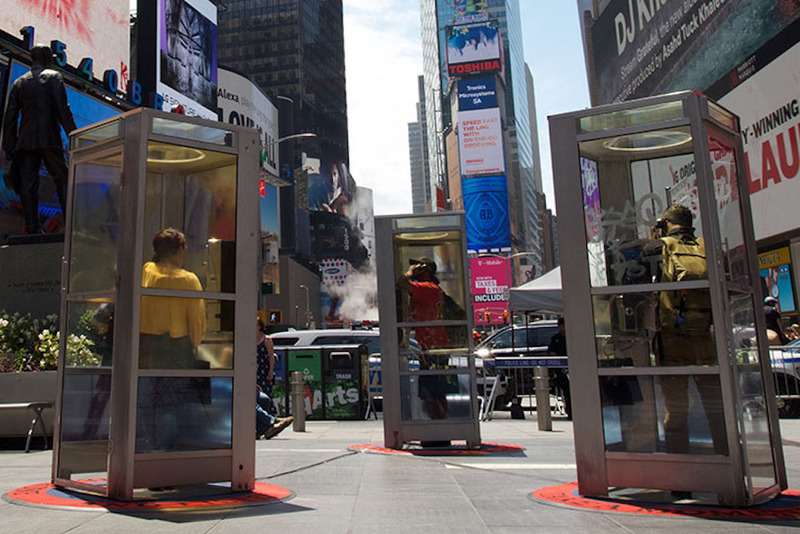 That’s exactly what’s happening in New York City, where old phone booths have been turned into a new interactive art exhibit that’s all about recognizing and celebrating the stories of immigrants. Afghan-American artist Aman Mojadidi wanted to bring back some of our histories as well as celebrate the immigration-centric melting pot that is the U.S. He first recorded the stories of several immigrants. Then, he renovated three phone booths in Times Square so that they play different immigrant stories each time someone picks up the phone. He calls the piece Once Upon A Place and invites anyone in the area to pay it a visit. The goal is to allow immigrants who have experienced trials, persecution and other difficult situations a safe place to share their stories. It’s also meant to drop some of the barriers separating people of different backgrounds and help people have a little compassion and empathy for those coming to a new country. In total, there are 70 stories recorded in multiple languages. Mojadidi asked participants simply to tell their stories in whatever language they felt comfortable using. When you pick up the phone, you’re not sure what you’re going to get, but you’ll hear anything from two to 15 minutes of story without translations. He talked to immigrants from places like Tibet, China, Belgium, Mexico, Nigeria and more. “For me, the most important outcome of Once Upon A Place is that, no matter how different the experiences of migration might be among the storytellers, visitors will hear the common humanity in their voices,” Mojadidi said. Mojadidi said that he chose Times Square for many reasons, but mostly because it’s a place where many cultures come together on a single playing field. “It made sense with the notion of what Times Square is—a highly visible, international space,” he said. “This issue of immigration has become so politicized. Globally, any sort of major city is built on immigration rather than destroyed by it.” His hopes are that these stories will help people drop stereotypes about immigration and see the issue a little more clearly. Mojadidi said that the most difficult part of the project was actually getting the immigrant’s stories, some of whom were anxious about current political uncertainty, including the travel ban imposed by the Trump administration earlier this year. “Everyone was quite dubious and suspicious about what we were even doing—most people walked away,” he said. In order to work around this bump in the road, Mojadidi spent some time with cultural centers where he organized events that allowed people to share their stories in a safe environment. In the end, he was able to hear and record many different stories to be used in his cultural exhibition. The booths were put up just before the Independence Day holiday, a strong statement about America’s supposed freedoms. It will run until September.